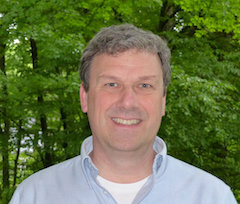 Dean R. Madden, PhD started teaching math at a summer ‘bootcamp’ for MPP students, and has since taught math, biochemistry, and biophysics in Munich, Heidelberg, Cambridge, and Hanover. He served as Chair of the MCB Graduate Program and has participated in Dartmouth’s Strategic Planning for Graduate Education and the Geisel Curriculum Reform initiative, where he served as co-chair of the Biomedical Sciences Working Group and a member of the Master’s Degree Task Force. Dean is currently serving as Vice Provost for Research for Dartmouth College. He is also course director for BIOC101 – the MCB first-term core course, and PI of two program-project grants: the COBRE Institute for Biomolecular Targeting and the Dartmouth Cystic Fibrosis Research Center. Dean is interested in understanding binding interactions of the cystic fibrosis transmembrane conductance regulator (CFTR), a chloride ion channel found in the lung and other epithelial tissues. CFTR mutations leading to trafficking and folding defects are the most common source of genetic disease among Caucasians. Our goal is to characterize the interaction of CFTR with binding partners that regulate trafficking and folding processes.